This tale of Howard Hughes, Hollywood and honey babies isn’t enriching enough. Rules Don’t Apply can be thrown onto the growing pile of 2016’s most frustrating movies. They’re the missed opportunities, the ones with loads of potential and talent that still fall short of true greatness. That includes movies like Arrival, Desierto and Doctor Strange, not to mention the big-budget hot messes Batman v. Superman, Suicide Squad and Star Trek Beyond (okay, now they’ve been mentioned, too). Things start so well. It’s 1964 Hollywood. The movie looks terrific (thank you once again, Caleb Deschanel) and there’s a spunky pace to the action, at least in the beginning. It certainly doesn’t hurt the people are beautiful, too. That includes Lily Collins (Mirror Mirror — and daughter of Phil Collins) as Marla Mabrey, Haley Bennett (this year’s remake of The Magnificent Seven) as starlet Mamie and Alden Ehrenreich (Hail, Caesar!) as Frank Forbes. 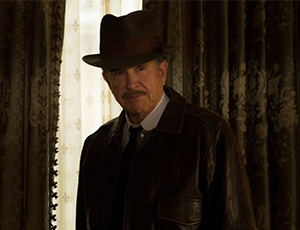 Then there’s Howard Hughes himself, played by 79-year-old Warren Beatty; the screen legend returns to the big screen for the first time since Town & Country in 2001. Howard is the puppeteer of the movie’s madness. There are businessmen who want to meet with him — in person — before signing off on a $400 million deal involving the airline TWA. Howard won’t do it, constantly putting them off and hanging up on them. There’s a subplot revolving around Howard’s mental state and marital status and how they might play into his ability to maintain control of his empire. And there’s a bevy of 26 (or so) starlets looking for their big screen test with Howard. They’re all his playthings. Under contract regardless of whether or not they ever act, their paychecks are dangled from a studio window like fish bait. It’s quite a busy dance card for one movie, one with a core built around many very real Howard Hughes news items and covered by a marzipan shell of Hollywood confectionery. Oh. Wait. There’s one more thing: Howard has rules. One of them is the drivers are not allowed to romance the starlets. Well, that’s one rule ripe for the breaking as Marla and Frank hit it off and do their own little dance around young love. That’s despite the fact Frank is engaged to marry his 7th-grade sweetheart. In the thick of all this, Marla sings a little number called Rules Don’t Apply, a sweet song that seduces Howard and puts Marla in a compromised position, particularly for a young woman in 1960s America. It’s a scattershot movie. Sometimes it’s funny, sometimes it’s sweet, at other times it’s dramatic, but a large part of the time it doesn’t seem to know what it is or where it’s headed. That’s quite an identity crisis coming from the man behind Heaven Can Wait, Reds and Bulworth. What’s the point? What sensation should audiences walk away with? The answers are hard to find. Perhaps the crux of the problem is the handling of Howard himself. Ostensibly documenting the beginning of Howard’s end, the movie at one point shows him sitting at the edge of a pier at night, eating a burger and admiring the plane that will mockingly become known as the Spruce Goose. Moments like that probably happened in some fashion in real life, but Beatty doesn’t manage to bridge the surface-still waters of Howard’s obsessions and eccentricities, both those within and without his control. It’s less of an impression of a man entering the ultimate and final state of confusion and more like simply a confused impression of one incredibly quirky man. What Beatty fails to do — quite resoundingly — is find the humanity within Howard and his challenges. Truly, this might be the biggest blown opportunity of the year in moviedom. The real Howard Hughes no doubt still lurked beneath the surface, fully aware of the nightmare he was entering. Capturing that would’ve made for compelling Oscar bait.